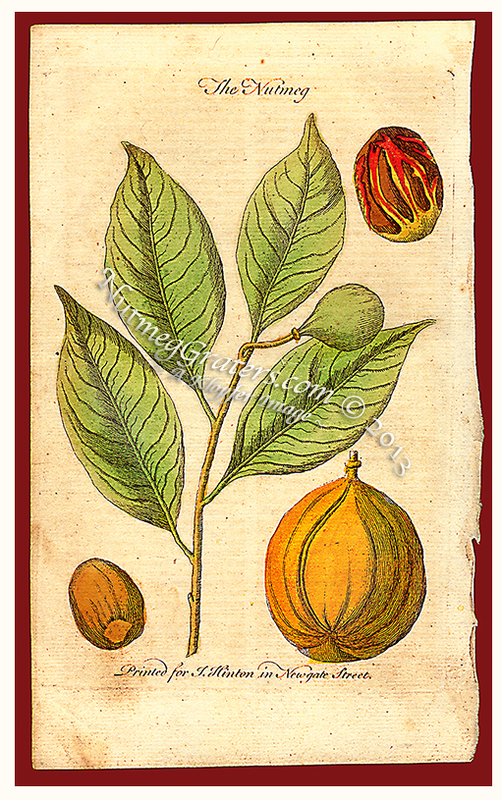 PRINT ENTITLED: "The Nutmeg ~ Printed for J. Hinton in Newgate Street". SOURCE: Universal Magazine of Knowledge & Pleasure. PRINTED FOR: "J. Hinton in Newgate Street." (London). DATE OF PUBLICATION: January 1757. SCOPE AND PURPOSE OF PUBLICATION: A gentleman's magazine and historical chronicle pertaining to culture, commerce and invention. PAPER TYPE: Handmade antique laid and chain ~ link paper, bearing no water mark. COLORING:	Hand Coloring (Source Page 13: "With the Nutmeg Plant and Fruit, coloured from Nature"). HISTORY: The Universal Magazine of Knowledge and Pleasure was published from 1747 through 1814 in London. It was a Gentleman's Magazine containing "news, letters, debates, poetry, musick, biography, history, geography, voyages, criticism, translations, philosophy, mathematicks, husbandry, gardening, cookery, chemistry, mechanicks, trade, navigation, architecture and other arts and sciences; which may render it instructive & entertaining to gentry, merchants, farmers and tradesmen." It was published by John Hinton and contained "many instructive plates, usually with keys."